Essentials of Research Design and Methodology contains practical information on how to design and conduct scientific research in the behavioral and social sciences. This accessible guide covers basic to advanced concepts in a clear, concrete, and readable style. The text offers students and practitioners in the behavioral sciences and related disciplines important insights into identifying research topics, variables, and methodological approaches. Data collection and assessment strategies, interpretation methods, and important ethical considerations also receive significant coverage in this user-friendly guide. 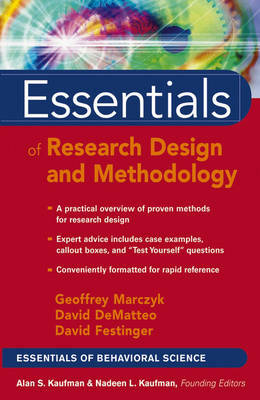 Essentials of Research Design and Methodology is the only available resource to condense the wide-ranging topics of the field into a concise, accessible format for handy and quick reference. As part of the Essentials of Behavioral Science series, this book offers a thorough review of the most relevant topics in research design and methodology. Each concise chapter features numerous callout boxes highlighting key concepts, bulleted points, and extensive illustrative material, as well as "Test Yourself" questions that help you gauge and reinforce your grasp of the information covered.